Disclosure: I received product for review purposes. Opinions on this blog are my own. I love drinking smoothies, but there is a fine line between making the smoothie healthy or having it be more like a dessert. I was never crazy about protein powder in the past and always found it tasted a little off when I used it. I tended to lean towards the more sugary smoothies, but now that I’m watching my weight, I’m not drinking them anymore. I recently had a chance to try out a smoothie powder unlike anything I’ve tried in the past. In fact, this smoothie powder is unlike anything on the market today. KURA is the smoothie for foodies. 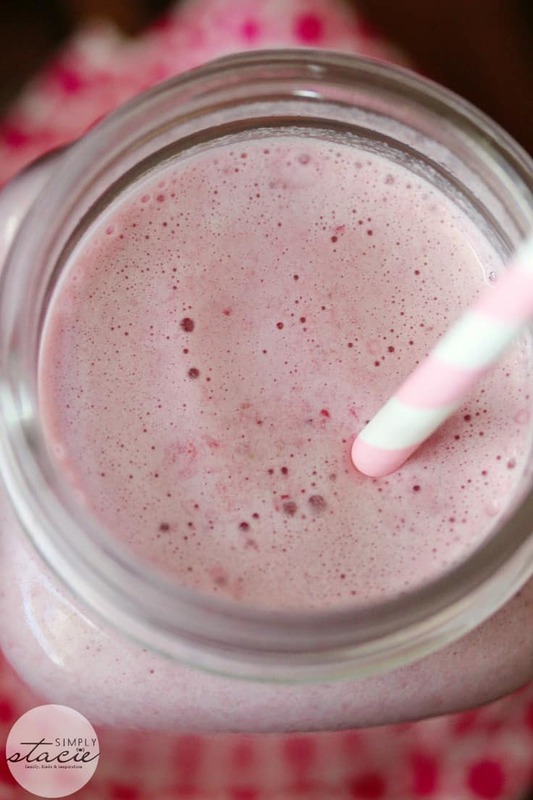 It’s healthy with loads of vitamins and minerals and boy does it make your smoothies taste GOOD! Each serving of KURA gives you 14 grams of pure New Zealand dairy protein, 5 grams of fiber, 26 essential vitamins and minerals (including Vitamin D, C, B6, B12), 5.4 grams of Omega-3’s, and probiotics and more. It’s also GMO Free, Gluten-Free with no added sugar, no preservatives and nothing artificial. It’s pure healthy goodness in a glass. Did you know that GMO’s are illegal in NZ? I didn’t realize that. They have three flavours in a variety of sizes including Vanilla, Chocolate and Berry Smoothie Powder in individual sachets (1.4 oz. = 1 serving) and large bags (1 lb. = 12 servings). Extra Large bags at 35.3 oz. bags are coming soon (24 servings). I love the fact that there is no added sugar so I can enjoy a smoothie for breakfast guilt-free. I’ve lost a ton of weight just by limiting how much processed sugar I eat. KURA fits perfectly into my healthy lifestyle. Making a smoothie is super easy and quick. I break out my trusty ol’ blender. Add in your beverage of choice (ie. soy milk, almond milk, regular, milk, etc). Then add in your fruits or veggies. I bought a bunch of frozen fruit when it was on sale so I’ve been using it up in smoothies. Add a scoop of KURA or an individual sachet in a flavour of your pick. Blend away. 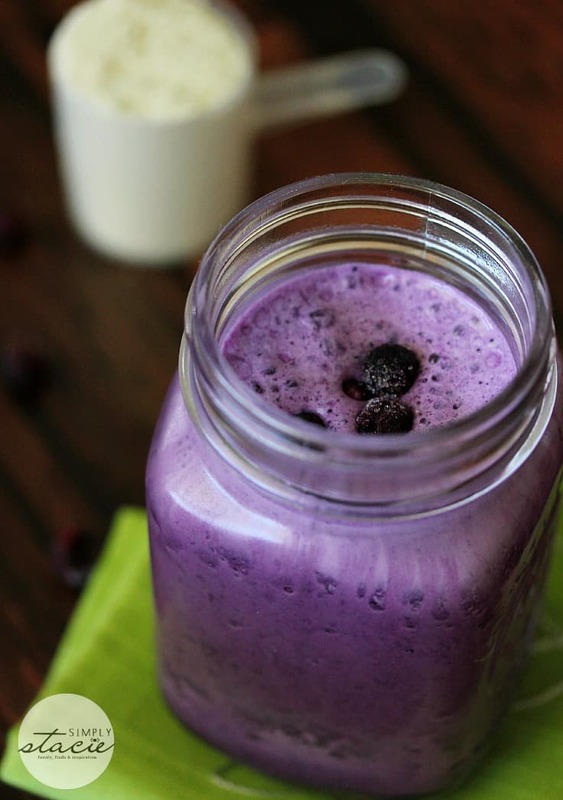 In a matter of minutes, you’ll have a creamy, healthy smoothie to enjoy. 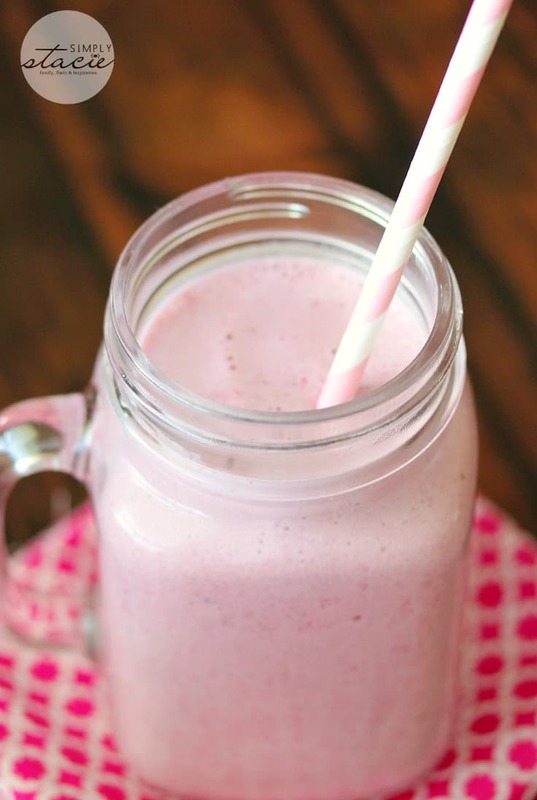 I made this particular smoothie with milk, frozen strawberries and vanilla KURA. 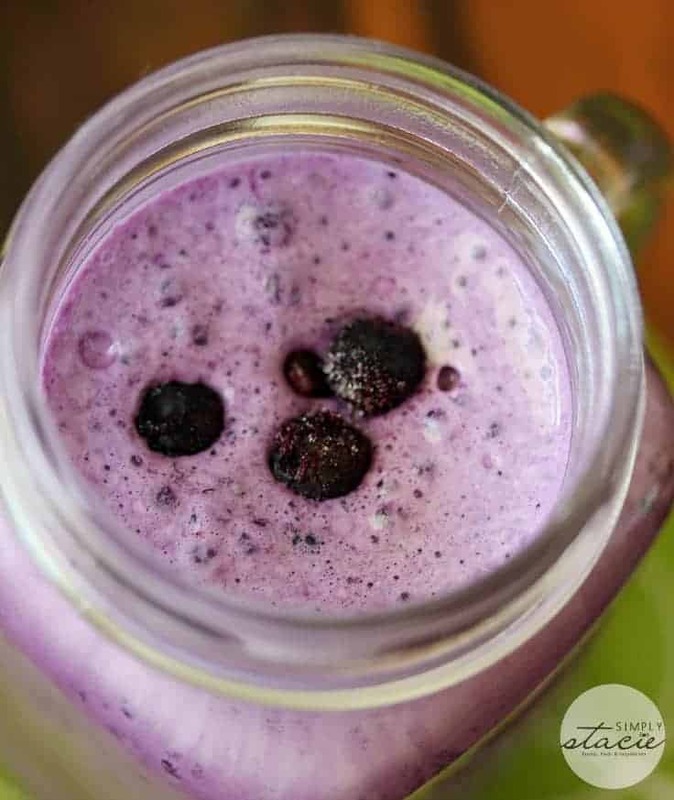 In this smoothie I used orange juice, milk, Berry KURA Smoothie Powder and some frozen wild blueberries. Super yum! Even John has been drinking them which is new since he normally turns his nose up at anything he perceives as “too healthy”. He can’t deny they taste good. That’s the most important factor to him. If you’re making a smoothie for a child, KURA recommends only using half a scoop of the smoothie powder. 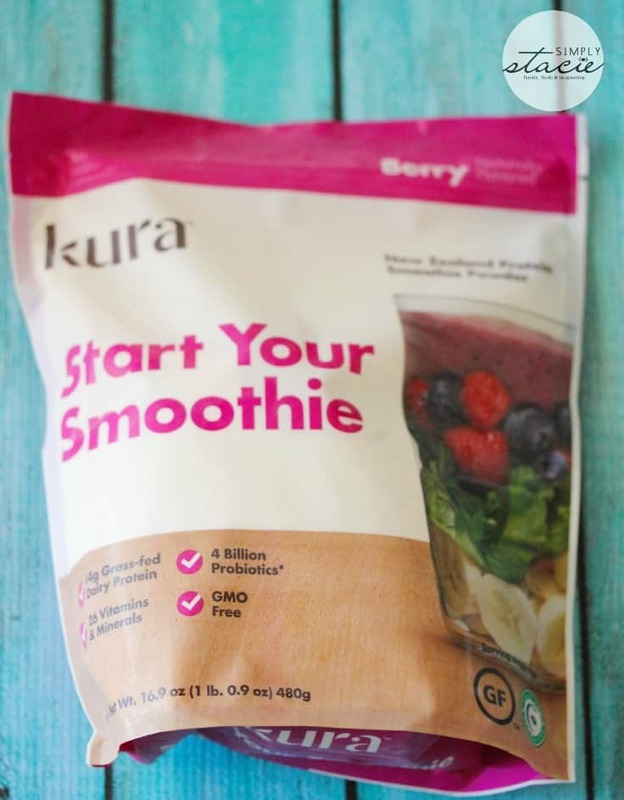 What kind of smoothie would you like to make with KURA Smoothie Powder? Connect with Kura on Facebook, Twitter and Pinterest. I learned that the product is GMO free. I learned that these are GMO free, which I really appreciate for my family. Thanks for the opportunity to win. I learned there is no added sugar. Love the ability to customize with fresh fruit of the season and the fact that it is packed with 26 vitamins and minerals! I like that it has natural ingredients and no added sugar. Kura products are GMO free which is harder to come by nowadays. I like it! I like that there is no added sugar. I love that Kura contains all the good stuff (anti-oxidants, vitamins & minerals, protein, pro-biotics & omega-3) and NONE of the bad stuff! I would especially like to try the Chocolate and the Vanilla ~ and add my own FRUIT (Berries)! Thanks! I learned that Kura is a protein powder that is GMO and gluten-free. I like that they use natural ingredients and don’t add any sugar. I learned the product contains Omega-3. I like that Kura is GMO and gluten-free, with natural ingredients and no added sugar. No sugar added and gluten free pack with protein sounds amazing! I learned that they are ‘customizable for the whole family’! I learned that it’s good stuff… GMO and gluten-free, with natural ingredients and no added sugar. natural ingredients and no added sugar! I like that their products are GMO-free, gluten-free and no added sugar. I learned it is GMO & gluten free. I like to try the chocolate shakes. I like that they contain 26 Vitamins and Minerals. I like how there are natural ingredients. I like that this products are GMO free. 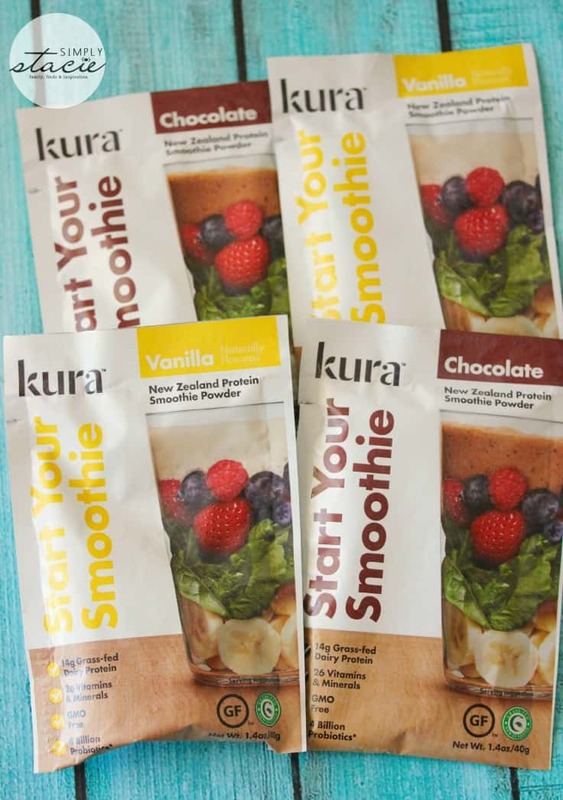 Thank You for the giveaway… each serving of Kura’s Smoothie Powder contains 14g of New Zealand grass-fed dairy protein; proven to have higher levels of omega-3s than grain-fed dairy protein. I like the versatility and the options!